Kevin Harvick was scheduled to start 13th. After three failures in pre-race insoection, he’ll go to the tail. In addition, he’ll be forced to serve a pass through penalty. Green flag, Chase Elliott gets the jump as Byron spins the tires on the bottom. Erik Jones to 2nd. Byron skates up the banking and pushes Erik Almirola into the wall! Kyle Busch is around behind them, he gets clipped by Ryan Preece. Stenhouse also collected damage. Kevin Harvick will be allowed to serve his penalty. He needed that caution. Green, Elliott gets the jump on Erik Jones. Jimmie Johnson started 10th, he’s now 3rd. 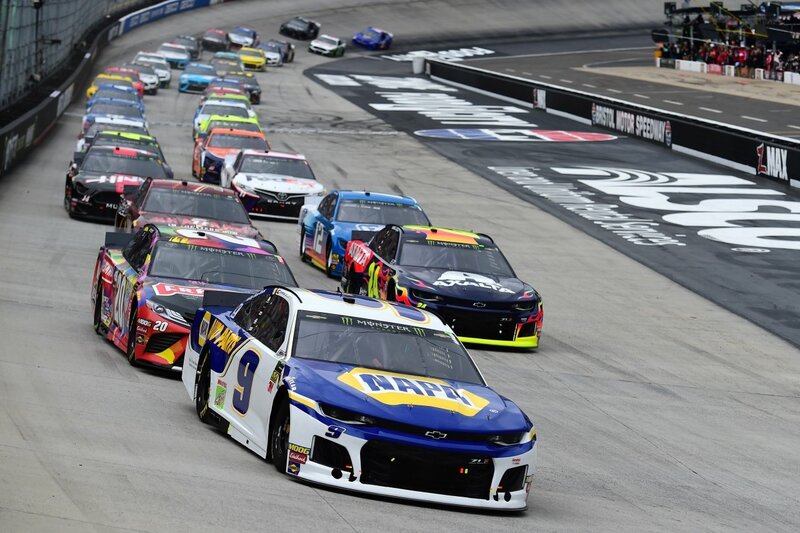 Lap 30, Chase Elliott leads Clint Bowyer by half a straight away. Ryan Blaney is on the bumper of Bowyer. Most of the field runs the bottom. Ryan Preece spins in front of the leader! Elliott is on the brakes. Corey LaJoie gets into the back bumper of the leader. Elliott gathers it up with minimal damage but falls to 3rd. The caution is out. Most of the field heads for the pits. Hamlin is the only car that doesn’t pit. Green, Hamlin leads. Jones is looking to take 2nd away from Bowyer. He takes that position. Jones runs down the leader. Erik Jones takes the race lead away from Hamlin. Ryan Blaney works to 2nd. He’s moved to the top and he’s running down the leader. Blaney pulls even and Jones lets him go, Blaney leads. Jones has an issue. Joey Logano gets into the back if him. Jones heads to the pit lane under green with a flat tire! Harvicks also heads to the pit lane under green as does Kyle Larson. Loose wheels for both. 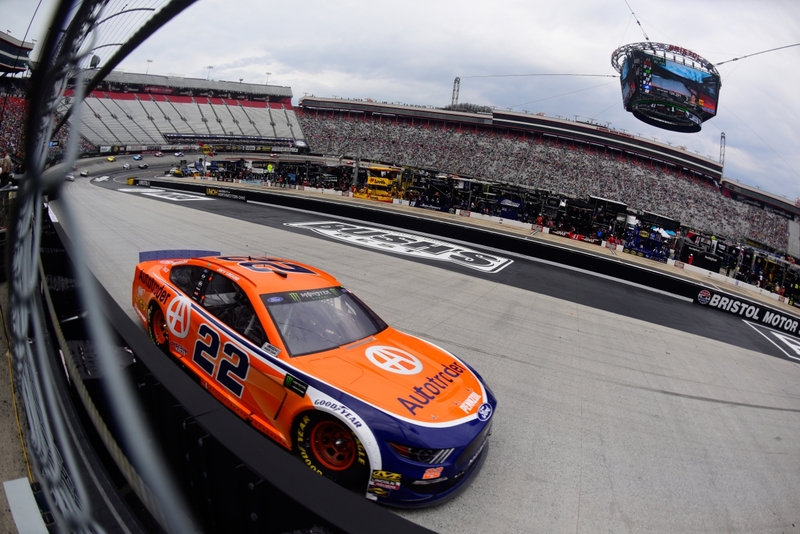 15 to go in stage 1 at Bristol, Blaney works heavy lap traffic. Bowyer has closed to his bumper. 8 to go, Bowyer gives a bump to Blaney. Bowyer heads to the bottom. He’s clear. Hemric is around will help from Chastain. The caution is out. Clint Bowyer, Ty Dillon and Paul Menard stay out. Everyone else stays out. Green, Bowyer and Dillon run side by side! Keselowski gives a bump, he’s looking for a way by with new tires. At the line, Ty Dillon wins stage 1 by just two feet! Chase Elliott has a power steering issue. He’s on pit road with the hood up as the crew goes to work. Green, Keselowski gets the jump on Joey Logano. Jimmie Johnson skates up the hill and loses a spot. Logano is working the bottom. He’s clear but leaves the lane open. Keselowski pulls even. They run three wide through lap traffic and Logano comes out with the lead. Lap 184, Logano leads Keselowski by 3 seconds. Kyle Busch was running 3rs, Truex just took the spot. Busch has battled back from the spin on lap 1. Lap 208, Logano has been trying to lap Elliott for several laps. Elliott tags the wall and Logano completes the pass. He remains without power steering. The yellow is out as Elliott gets into the back of Matt Tifft and turns him around. Chase Elliott will get the free pass. The field heads to the pit lane. Green, Logano gets the jump with a big push from Martin Truex Jr. Truex is on his bumper again in turn one but Logano holds the lead. 8 to go in stage 2, Martin Truex Jr is slow. He’s dropping like a rock but remains on track. The driver thinks he has a loose wheel. 4 to go, Martin Truex Jr heads to the pit lane under green. 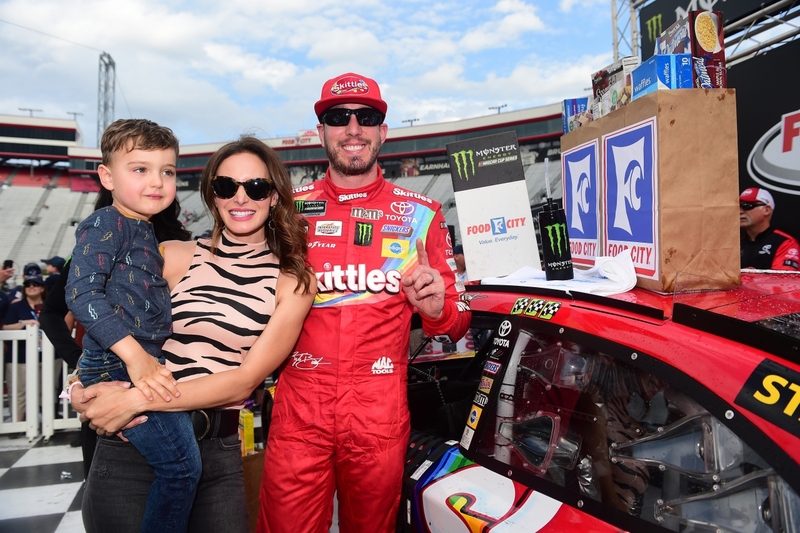 Joey Logano wins stage 2 at Bristol! The field heads to the pit lane. Keselowski is in first and out 2nd. Ryan Blaney wins the race to the pit exit. Penalty: Too fast entering pit road for Jimmie Johnson. Truex entered a closed pit. Suarez will also go to the back. Green flag on stage 3, Blaney gets the jump on the outside. He cuts to the bottom in turn one. Lap 270, the caution is back out. Debris on the track. Penalty: Suarez pitted outside the box. That’s a one lap penalty. A crew member pulled tape as Suarez left the box. Green, Blaney leads. Bowyer and Logano battle for 2nd. Bowyer takes the position around the top. Logano fights back on the bottom to retake the spot. Chase Elliott is inside the top-5. He’s doing this without power steering. Lap 320, Erik Jones is on the pit lane under green. Lap 329, Blaney is working to lap Bubba Wallace. Meanwhile, Logano and Bowyer have closed. All three run around the top of the race track. 147 to go, Logano is working the bottom. He’s clear off the corner. Logano swings to the outside wall off the corner and Blaney gives him a bump as he comes off the top with more momentum. Logano takes the lead. Bowyer muscles his way by as well, move him to 2nd. 136 to go, lap cars are three wide ahead of the leader. They fade and Keselowski splits the middle. Bowyer is on his bumper. Kevin Harvick passes the leader and gets one of his laps back. Bowyer moves by Logano to take the lead. Harvick has a flat! The leader passes him back and the caution is out for debris. The field heads to the pit lane. Bowyer is first in and first off. Green, Bowyer and Busch run side by side for the lead. Busch wiggles hard off the corner as he puts the power down. He’s still clear off the corner. Kyle Busch moves to the race lead. 92 to go, Busch runs the top. Bowyer works the bottom. Kyle Busch tags the outside wall, Bowyer drives by on the bottom. 86 to go, Larson gets into the back of a lap car. Larson pushes up the hill and collects William Byron, both of them are in the wall. The field heads to the pit lane. Hamlin is out first with two tires. Busch is off 2nd with four. Penalty: Too fast on pit road for Denny Hamlin! Green, Busch gets the jump. Bowyer falls to 4th as he spun the tires then got loose in the center of the corner. Keselowski runs 2nd. Ryan Blaney wasn’t clear of Newman but he took the space anyway. Newman is on the wall. Elliott and Newman made right front to left rear contact. Elliott now has a rub on the right front. 69 to go, Bowyer is in the wall! He has a flat right front. Elliott is in the wall as well, flat tire for him. 60 to go, the green is back out. Kyle Busch leads Logano. Joey Logano works the bottom. He pulls to the number of Busch. They run side by side for the lead. Logano is clear off turn four. 22 to go, Larson is in the wall again. The caution is out. Logano and Keselowski pit. Kyle Busch and Kurt Busch stay out. Keselowski is off first with two tires. Logano is off 2nd with four tires. Keselowski will restart in 5th. 14 laps to go. Green, Kyle Busch leads his brother at the front. Keselowski was three wide at the starting line. He wasn’t in the right place for the restart. Penalty: Brad Keselowski has been penalized for the restart. He’ll have to come to the pit lane under green. 10 to go, Kurt Busch has climbed to the bumper of Kyle Busch. They both run nose to tail around the top. 4 to go, Kurt Busch wiggles at the entry to the corner. He tags the wall and Kyle opens the gap. 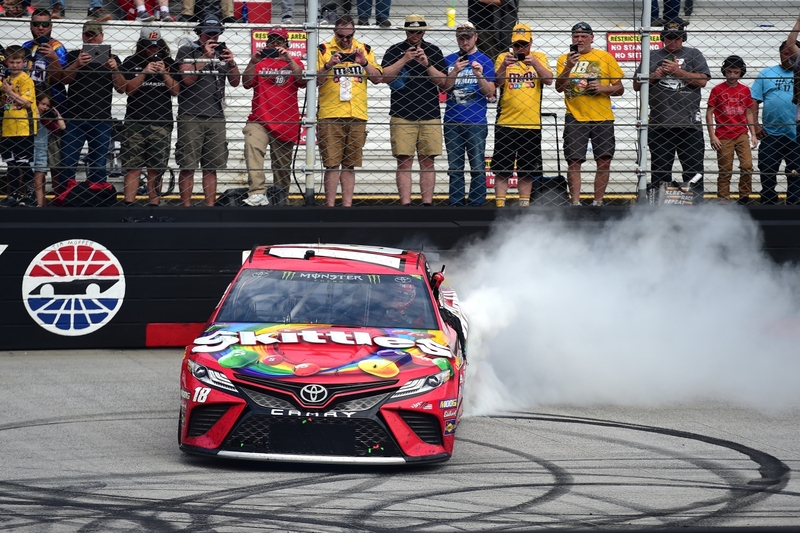 Kyle Busch wins the NASCAR race at Bristol Motor Speedway! 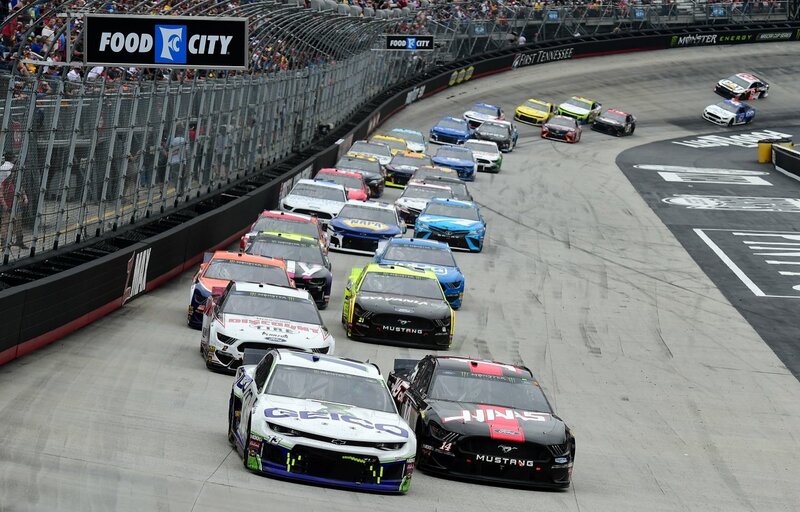 View full Bristol Motor Speedway results below.